I also very much dislike asparagus. But that’s a whole other story. According to Wikipedia, the sweet potato is full of complex carbohydrates, dietary fiber, beta-carotene (a provitamin A carotenoid), vitamin C, vitamin B6, manganese and potassium. In short, it’s considered to be one of the most nutrient rich foods in the world. And I hate them. I dislike them with a passion. They’re mushy, orange, sweet in a way that makes no sense, and the thought of them makes me gag. I’ve never had them prepared in a way that I could stomach. I was probably five years old the first time I came into contact with them. They were covered in marshmallows at a Thanksgiving dinner being held at my grandfather’s house. Well, anything covered in marshmallows and somehow not considered a dessert was good in my book, and I asked for a large helping. This was a mistake. Under the singed marshmallow layer was a bright orange mess. I tried to pick the marshmallows off and only eat them, but it was too late. They were already completely tainted by the vile sludge. As I recall, it was not a particularly good Thanksgiving dinner for me that year. But I’m 31 years old now. And I can’t keep shoveling whatever I want down my gullet. I have to make sure I’m getting all my vitamins, nutrients, yada yada yada, or I guess my body will just quit on me before I’m ready. And I’ve still got things to do, man. Like catch that damn shark. So I’m looking for ways to incorporate this supposed super food into my diet, without making myself gag. Enter Deceptively Delicious, stage right. This is a cookbook to feed picky child eaters. No, I’m not the least bit ashamed. Sometimes we have to regress in order to progress. You see what I did there? Cute, right? 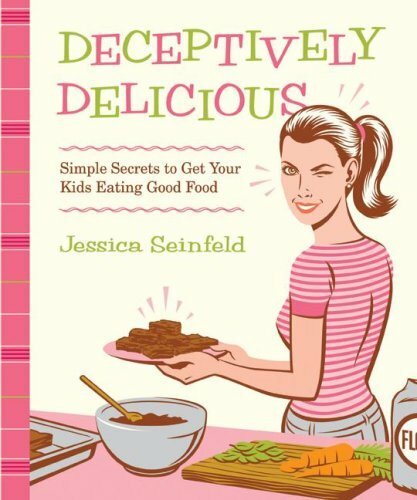 Anyway, Deceptively Delicious was written (there’s some controversy here but for the sake of this post let’s say she’s the totally legit author) by Jessica Seinfeld, wife of comedian Jerry Seinfeld. She claims their three children: Sascha, Julian and Shepherd, are incredibly picky eaters. Particularly when it comes to eating vegetables. Now in total honesty, I bought this cookbook a couple or so years ago when a friend of mine was planning her pregnancy, and she picked it up for herself and her husband. After flipping through it, I thought my hubby and I could give it a try. And it has sat on my bookshelf mostly untouched. Well that’s not totally true. There is a spectacular recipe for Chocolate Pudding made with avocado. Cross my heart, this is actually a delicious dessert, and you barely notice the avocado. And it’s the only well-worn page in the book. But, there are a lot of other good ideas in it. Seinfeld’s method for tricking her kids into eating more veggies is to cook and purée them all at the beginning of the week, and then slyly add them to food as she cooks the daily meals. I think if there were multiple storage bags of colorful goo in my fridge, I might actually pick them up and dump them into what I’m cooking. Just to see what happens. For sweet potatoes, she writes that you do not peel them, but cut them into quarters if you want to steam them. For roasting you leave the sweet potato whole. You don’t really save time either way. According to the book, it takes 40 to 45 minutes to steam and 50 to 60 minutes to roast them. After that it’s pretty straight forward: let them cool, scoop out the flesh and throw them into the food processor or blender until they are puréed. Store the mush in a zip top bag in your fridge and pull it out to add to recipes throughout the week. And I suppose that’s enough to be getting started with. So this week, once I stop retching over the thought of it, I’m going to try at least one of these recipes with the sweet potato purée. Maybe I’ll never get over my aversion to the damn things, but it might be possible to trick myself into eating it every once in a while. Just a side note about this book, I actually really enjoy the artwork. Pictures of the recipes are presented simply with no pretense. It’s the food and not a bunch of frilly fluff to distract you. The entire book, from the cover art to the page borders and color choices, feel very 1950s kitsch. A fun retro vibe permeates throughout from the way the beets are drawn to the tablecloths the food is resting on to the backgrounds of the chapter heading pages. It feels like a very deliberate choice, without it being in your face when you’re trying to actually use the book. The recipes are also very simple and tailored to a child’s taste. You won’t find Indian spices, Asian sauces or anything very exciting really. But I assume, once you start adding hidden veggies into this simple food, it wouldn’t be very difficult to start adding it to more complicated recipes you love. Right now, all I’m trying to conquer is the sweet potato. Maybe then I’ll start adding the cauliflower to mashed potatoes and scrambled eggs or butternut squash to my quesadillas. Maybe. Keep in mind that the more you cook something, the more vitamins and nutrients deteriorate. Cooking them down to a puree and then cooking them again in something else may not be worth all the time and energy. Just move on to some other “super” foods that you actually like. You think? Maybe you’re right. Hmmm. I am with you sister. I hate sweet potatoes as well. I have tried them mashed, baked, fried etc. and no matter how you cut them they are gross. My tummy just brings them up every time. I also feel the same way about asparagus, my tummy cant stand that neither. THANK YOU! I hate asparagus something awful too. Maybe we’re cut from the same cloth. 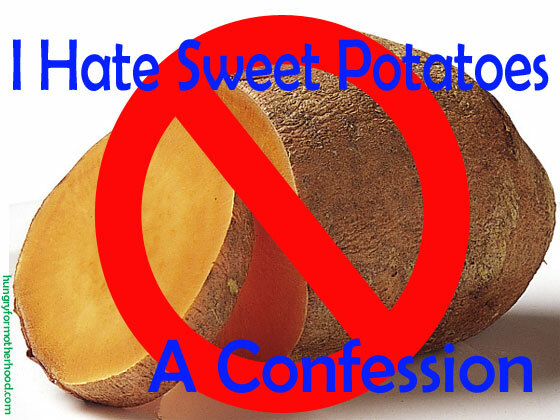 Please ,let sweet potatoes be one of those nasty food fads that dies a quick death!